Confessions of an ADD English Teacher: friday finals: savings on meat! One of the biggest complains I hear is there are never coupons for meat. Not so! The coupons are usually attached to the purchase of other items like spices or charcoal. Also, big savings on meats can come by checking the markdowns in the meat section of your store. Today, I found these lovely pork loins that are normally $9.99, with $4 off stickers on them. Not a bad deal, but it was made even better because I had $1/1 hormel meat coupons PLUS a $5/30 store coupon! 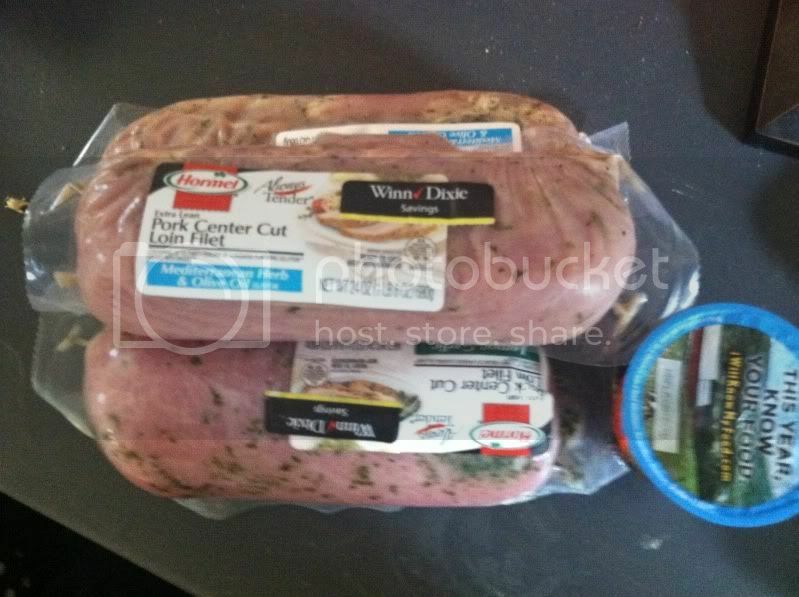 I was able to score 4.5 lbs of pork tenderloin for just $7! That's just $1.75/lb! It was 77 percent savings. I also had to buy a yogurt (marked down to 45 cents) in order to hit the $30 total. Without the yogurt my total was $29.97 and the coupon won't round up even for 3 cents.